The continuously growing popularity of E-Learning plays a vital role in modern education. But what exactly is E-Learning? Electronic(E)-Learning is training and education that is supported or provided through electronic means and/or communications technology. E-Learning comes in a great variety and can be delivered through simple audio tapes to complex online learning platforms. E-Learning is around already for longer than one might think because it is often confused with Online Learning. And though the education on demand concept is a huge opportunity it comes with a couple of disadvantages as well. Let’s take a look at the origins, types, benefits, and disadvantages. Many sources define E-Learning as a “network-enabled transfer of skills and knowledge”. Because of the work network inside it might often be confused with Online learning (which is just one form of E-Learning). I still remember when the term CBT (Computer-based training) came up many many years ago before any form of online training was possible for the average student because a network connection was too expensive or simply didn’t exist. Later this form of training developed into WBT (Web-based training). WBT was more and more enhanced with multidirectional tools and collaborative components. Distance learning is around for a long time already. In the Mid 19th century educational content was already delivered through the postal system. This enabled students far away from trainers and classrooms to participate in training. Distance education is basically the training of learners in remote places without face-to-face communication. 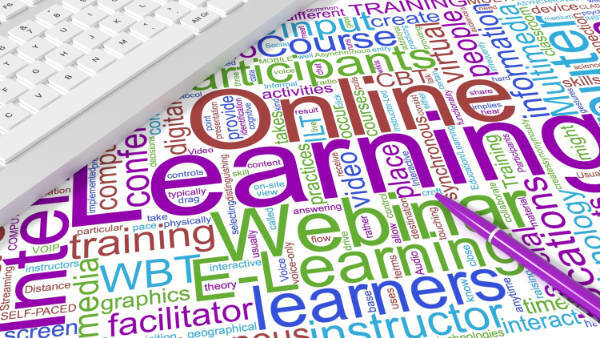 Online learning is essentially the evolution of distance learning by utilizing an internet connection to deliver educational content. Students with a PC and an online connection are able to participate in classes and receive study material through courses, email, video or audio conferencing and nowadays complete virtual classrooms. Virtual learning is the next step in online learning. It tries to eliminate one of the major disadvantages of online education: The lack of social interaction and group learning benefits. Getting back to traditional classroom learning with the means of virtual technology enables trainers and students to be physically apart while still being integrated into a group of learners. This way of education brings back the motivational aspect of group learning which is learning from each other as well as being part of a community with a common goal. With constant improvements of augmented and virtual reality online classrooms will further evolve so that students will be more and more immersed in the learning experience. Blended learning is as the name suggests a mixture of classroom training where teachers and students are co-located and the use of online training where students are educated with some flexibility of time, place and pace. One important aspect of the online part is that it is guided through some kind of formal educational program. To further understand blended learning lets take a look at 4 different models mentioned in “Classifying K-12 Blended Learning“. In this approach, the teacher defines a fixed schedule in which students rotate between the different learning methods. These activities could be instructor-led classes, online learning at home or group projects together with other students. In the Flex Model students are primarily educated through the internet. The curriculum is still provided by an educational institution but the students can customize their schedule and pace according to their needs. Additionally, a certified trainer is defined to assist when needed through face-to-face support. Students are educated with the traditional classroom training but can choose additional online courses which will be delivered through the classroom teacher. The students can decide for themselves if they like to take the courses at the educational facility or at home. In this model, students get the normal whole-school experience by attending regular classes onsite. Additionally, if their grades have a sufficient level they are able to decide to complete certain courses at home. The difference to the Self-Blend models is that the regular training can be shifted to remote as long as the students perform well during the onsite training. Mobile (M) Learning is an educational system where the training material is delivered through mobile devices. This can be Apps that either use online course material or offline resources to deliver educational material. This is usually done in an interactive way through quizzes and courses rather than just plain text. Especially mobile phones that are constantly with us enable us to learn anything and anywhere. They enable us to use otherwise lost time like subway rides for training. The biggest benefit of E-Learning is certainly the independence and the ability to decide when, how and what to study. Unfortunately, this goes hand in hand with the risk of not learning at all. If you struggle with finding the right motivation for getting started with your studies you might want to take a look at my extensive article about self-motivation. The cost-effectiveness is not only valid for companies when they start to train their employees with self-made or online E-Learning resources instead of sending them to expensive seminars. Quality online courses, practice tests, and training videos are getting more and more affordable and are often even accessible for free. Online learning platforms like Udemy (pay per course) or Simplylearn (Pay per month) offer quality content from enthusiastic trainers (like myself) for an acceptable price which is often lower than that for a single textbook. Besides, the cost of training materials is not the only benefit. Additionally, no money needs to be spent on transportation or meals in between. Once a classroom training is over it is over. If you missed it, got distracted or didn’t understand it the first time there is usually no easy way to do it again. E-Learning content is repeatable, can be paused, slowed down, printed or whatever helps you to better understand the material. E-Learning materials (even with nowadays 1-day delivery) is accessible much faster than classroom training. Online courses, eBooks or training videos are available instantly (If you have a working internet connection). With increasing bandwidth all over the world, content does not even need to be downloaded anymore, just stream it to any device. Flexibility does not only refer to the self-paced aspect of E-Learning. Evaluating the material before you purchase it and changing it when you find out it doesn’t fulfill your training needs is a very beneficial part of E-Learning. Classroom training is usually bound to a specific trainer, study group an environment which isn’t as easy to change as your settings at home. I offer practice tests for various certification in a self-developed App and I am feeling a responsibility towards my students. I am taking every piece of advice and feedback I can get and try to improve my material and learning experience. This is a huge advantage for me and my students because the material is evolving and getting better to fulfill the learning expectations as good as possible. One of the biggest benefits, the self-paced aspect of E-Learning is also the biggest disadvantage. If you attend a classroom training which requires you to physically show up you might be much more “motivated” to attend. Not only is the lecture most likely a one-time event but you also don’t want to appear lazy in front of other students. Probably the biggest advantage of classroom training is the immediate feedback you can get from teachers. The fact that students are able to ask questions and that possible mistakes can be corrected and explained instantly is a huge benefit. This prevents you from memorizing the wrong things before they sink into your memory. Sure, online courses also contain features to ask questions and get feedback but it is not guaranteed and often delayed. The most intensive learning experience is when a skilled trainer sits right next to you and shows you how to do it. Learning all by yourself can be a lonely endeavor. Having a study buddy with the same goals can be incredibly motivating. Of course, modern communication technologies allow video conferencing or chatting but that is just not the same as having someone sitting next to you and going over the material together, discussing problems and working on solutions as a team. Osmotic communication is actually something I came across during my Scrum project management studies as one of the advantages of working in a co-located team. This simply means that you learn something just by overhearing others talk about it. This is not just the training in the classroom, you might hear something during breaks, in the cafeteria or on your way out, a fact you didn’t think of or a question you missed. Using what you have learned and apply it is way better than just reading it from a book. Schools are often much better equipped with labs or other tools that can provide a real “training on the job” for you. Teachers often encourage students to present their knowledge and the best way to remember anything is to teach it to others. One way to get around this is that I always create quiz questions for any exam I take. I prepare extensive practice tests (which also forces me to think of wrong answers) which I later use to teach myself by using my Quiz App to test me. This method has been incredibly valuable and proven very effective in all the exams I have taken. I know, I know… I just stated that E-Learning does not have to be online but nowadays most training and material are delivered through some kind of network. The time of traditional CBT where you just install a learning software is becoming a thing of the past. So if you are living in an area like me where a thunderstorm can easily knock out your internet access for a while a working online connection is crucial to E-Learning. But it is not only a matter of having internet or not, as study material is becoming increasingly complex the speed of your connection matters as well. Streaming content directly in ever increasing resolution certainly demands faster and faster internet. Furthermore many educational providers shift not only the content but also the applications into the cloud so that when your connection drops you can basically do anything anymore. What is Machine Learning? Machine learning is about making computers to learn like humans do including self-optimization and interpretation of information and data by observing real world situations. Though this is a form of learning that is as electronic as it gets it is not considered to be part of the E-Learning family in the traditional sense. What is Deep Learning? Deep learning is part of machine learning. It teaches computers to learn like humans from unstructured or unlabeled data like images, sounds, videos or texts. Is it eLearning, e-learning or E-Learning? The most common spelling of the word is eLearning according to the leading website eLearning Industry in this field. For the other 2 forms, there is no right or wrong, just make sure that the E and L match (either both capital letters or not). What is SCORM? Shareable Content Object Reference Model (SCORM) is a set of technical standards that was developed by the U.S. government. The purpose of SCORM is to harmonize the educational content by providing specifications and standards on how content objects, data models and protocols are related to each other and hence can be shared across SCORM compliant Learning Management Systems.